Sekiro, the new action game from FromSoftware, is full of tricky boss fights, but the side-bosses can be just as formidable. 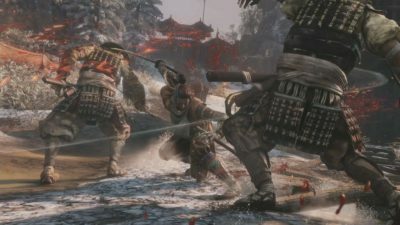 Here’s everything you need to know about how to beat Snake Eyes Shirafuji in Sekiro. It’s a side boss that you’ll come across towards the end of the Sunken Valley area of Sekiro. Starting at the Sunkey Valley Sculptor’s Idol, head out of the cave and down the cliff on the right hand side, grappling onto a tree on the way down to ensure that you don’t fall to your death. Once you’ve made your way down, you’ll come across a wooden bridge over the valley. Run across that quickly, looking out for the gap midway along it, and be careful of the enemies shooting at you from above. You’ll soon come across the area in Sekiro where the Snake Eyes Shirafuji is, so take it slow. If you stalk it from down low, you can attack quickly when its back it turned to deal a lot of damage. The fight will then begin in earnest. The Snake Eyes Shirafuji is very quick, and has a arsenal of powerful ranged attacks using the gun that looks a lot like a staff. However, rather than sticking to shooting it, it will try to attack you with a swing or two. The best thing to do is to stay close as much as you can to attack quickly when the opportunity arrises, allowing you to limit the chance of the Snake Eyes Shirafuji using its swinging attack. It’ll draw its weapon to shoot quite quickly, so you’ll have to be paying close attention to block the attack with L1/LB, just as you often have to in Sekiro. You’ll then be able to attack quickly just after the shooting animation finishes. Just be aware of any powerful attacks, which are shown by the red kanji symbol appearing in Sekiro. When you see it, back off because the Snake Eyes Shirafuji is going to come out swinging. The attack is usually in swings of three, so back off and be patient. Once it’s over, move in quickly again to attack, being sure to have the block ready for the other attacks. You’ll soon get the chance to finish it off, just don’t be over confident. That’s everything you need to know about how to beat Snake Eyes Shirafuji in Sekiro. For more tips and tricks on the game, be sure to check out our Sekiro wiki guide.